New Palladini Tarot combines elements of medieval art, Egyptian art, renaissance art, and modern art in a bold, original style. The night sky backgrounds in the suit of Pentacles adds a meditative quality. Artist David Palladini's images are pleasing to the eye, they are bright, they are detailed, and so they command scrutiny. 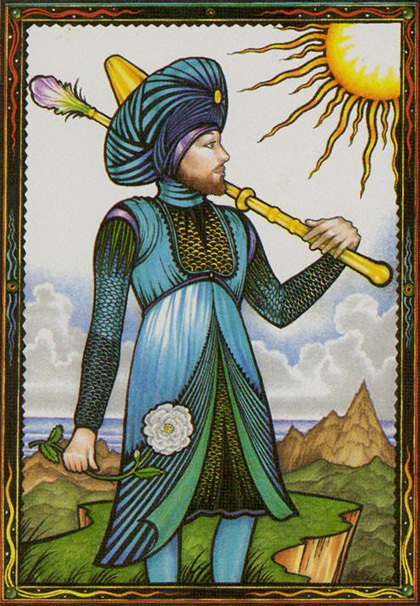 Palladini (creator of the popular Aquarian Tarot) favors medium-range and close-ups of human figures in most of the cards. One big difference between this deck and the Rider-Waite is that the human figures on the cards are much more individualized. The characters are not interchangeable -- they are distinct from one another; they are particular individuals. Tarot card illustrations © U.S. Games Systems, Inc.